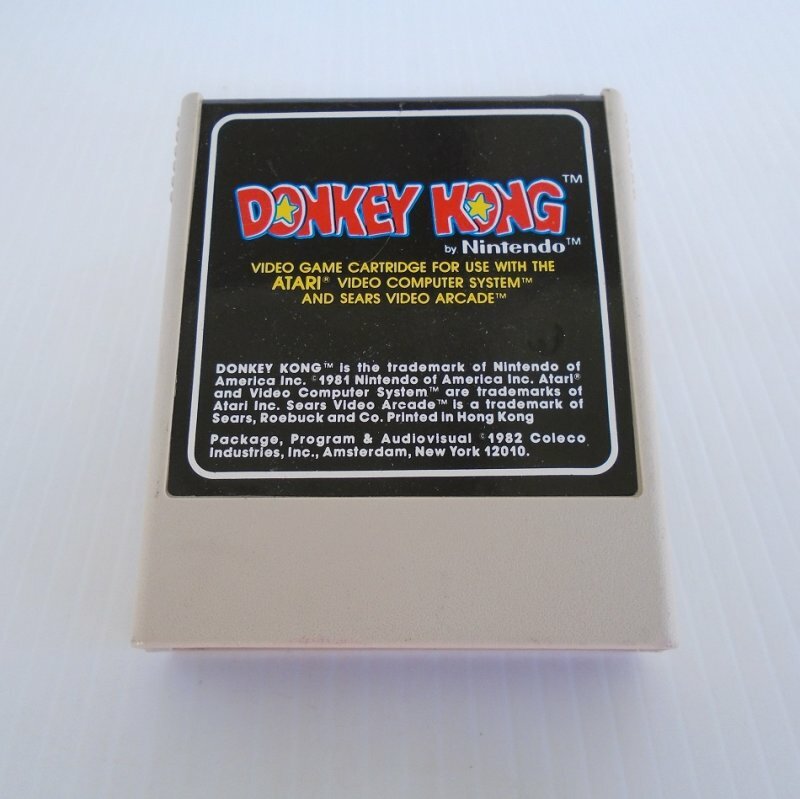 Donkey Kong game cartridge for Atari 2600 system. Label states "by Nintendo". Dated 1982. "Donkey Kong is considered to be the earliest video game with a storyline that visually unfolds on screen. The eponymous Donkey Kong character is the game's de facto villain. The hero is a carpenter originally named Jumpman, later renamed Mario. The ape kidnaps Mario's girlfriend, originally known as Lady, but later renamed Pauline. The player must take the role of Mario and rescue her. This is the first occurrence of the damsel in distress scenario that would provide the template for countless video games to come." The game is dated 1982. The label on the cartridge states it is "by Nintendo", but this game is not for the Nintendo system. It is for the Atari 2600. Game cartridge only. There are no instructions on how to play but that should be easy to find on the internet. There is no original box. I purchased about a dozen different Atari game cartridges recently. The guy I purchased them from said the last time they were played was about 5 years ago and there were no problems. They have been in storage, each cartridge individually wrapped for protection. I do not have an Atari system to test the cartridge with so I will allow returns but only if I am notified within 24 hours of delivery (per USPS tracking) that the cartridge is in non-working condition. Original selling price and original shipping will be refunded, return shipping charges will not be refunded. A refund will be issued once it is determined that the returned cartridge is the same one that was mailed. Buyer to pay USPS First Class Mail Parcel delivery charges of $4.40.